In one hand you hold the soldering iron, in the other the solder, and in two more hands the parts you’re trying to solder together. Clearly this is a case where helping hands could be useful. Luckily helping hands are easy to make, coolant hoses will do the job at under $10. Attach alligator clips to one end, mount them on some sort of base, and you’re done. Alternatively, you can steal the legs from an “octopus” tripod normally used for cell phones. So why would you 3D print them? One reason is to take advantage of standardized, open source creativity. Anyone can share a model of their design for all to use as is, or to modify for their needs. A case in point is the ball and socket model which I downloaded for a helping hand. I then drew up and printed a magnifying glass holder with a matching socket, made a variation of the ball and socket joint, and came up with a magnetic holder with matching ball. Let’s takea look at what worked well and what didn’t. [Sverd Industries] have created a pretty cool bench power supply integrating soldering helping hands into the build. This helps free up some much-needed bench space along with adding that wow factor and having something that looks unique. The build is made from a custom 3D printed enclosure (Thingiverse files here), however if you have no access to a 3D printer you could always just re-purpose or roll your own instrument enclosure. Once the enclosure is taken care of, they go on to install the electronics. These are pretty basic, using a laptop PSU with its output attached to the input of a boost/buck module. They did have to change the potentiometers from those small PCB mounted pots to full size ones of the same value though. From there they attach 4 mm banana sockets to the output along with a cheap voltmeter/ammeter LCD module. Another buck converter is attached to the laptop PSU’s output to provide 5 V for a USB socket, along with a power switch for the whole system. Where this project really shines is the integrated helping hands. These are made from CNC cooling tubes with alligator clips super glued to the end, then heat shrink tubing is placed over the jaws to stop any accidental short circuiting while using them. This isn’t a life changing hack but it is quite a clever idea if space is a hot commodity where you do your tinkering, plus a DIY bench power supply is almost a rite of passage for the budding hacker. [Punamenon2] wanted a soldering station with integrated helping hands. He couldn’t find one, but he decided it would be a good 3D printed project. In all fairness, this is really 3D printing integrating several off-the-shelf components including a magnifier, a soldering iron holder, a soldering iron cleaner, a couple of “octopus” tripods, and some alligator clips. Total cost? Less than $30. In addition to holding the Frankenstein monster together, the 3D printed structure also provides a storage tray with special sloped edges to make removing small screws easier. We think of helping hands as those little alligator clips on a metal stand. They are cheap and fall over, so we tend to buy them and don’t use them. However, if you are willing to put $35 or $40 into it, you can get the newer kind that have–well–tentacles–on a heavy base. [Archie_slap] didn’t want that kind of investment, so he made his own for about $10. We think that’s Australian dollars, so that’s even less in the United States. What’s better is he documented every step in meticulous detail and with great pictures. You probably won’t directly duplicate his project because you will probably pick up a slightly different base, but that’s not hard to figure out. The arms are actually coolant hose, [Archie_slap] picked up almost everything but the base plate on eBay. It’s obvious [Archie] is a frugal guy, based on his drill press. It gets the job done, though. The build is attractive and looks like a much more expensive commercial product. Some of us around the Hackaday lab are old enough to wish there was a magnifying glass attached, but maybe that’s version two. We’ve looked at a lot of different helpers recently. We couldn’t help but think about a somewhat similar Gorillapod holder we covered last year. If you are working with surface mount electronics and don’t have the handy heritage of a pulp-comic superhero to give you super-high-resolution eyesight, then you will quickly find yourself needing a magnifying glass. And since you’ll be using both hands doing the soldering, you’ll need some way to hold it. There are multiple solutions to this problem on the market, from headband magnifiers and inspection magnifiers on arms to cheap “Helping hands”. They all have their strengths and weaknesses, but none of them appealed to our reader [Anil], who wanted an illuminated magnifier to fit the Hobby Creek arm on his Pana-Vise. His solution was to 3D print a surround for a lens from a set of helping hands. This is no simple print though, it’s made of three layers. There is a translucent diffuser, a layer that holds a set of LEDs and attaches to the arm, and a cover to hold the lens in place. Power for the LEDs comes via USB. The print itself was a bit tricky, his diffuser used T-glase translucent filament, and was fused to the PLA LED ring in a single print from his dual-extruder printer. He takes us through the various steps he needed to get it right, and shows us a few of his failed prototypes. 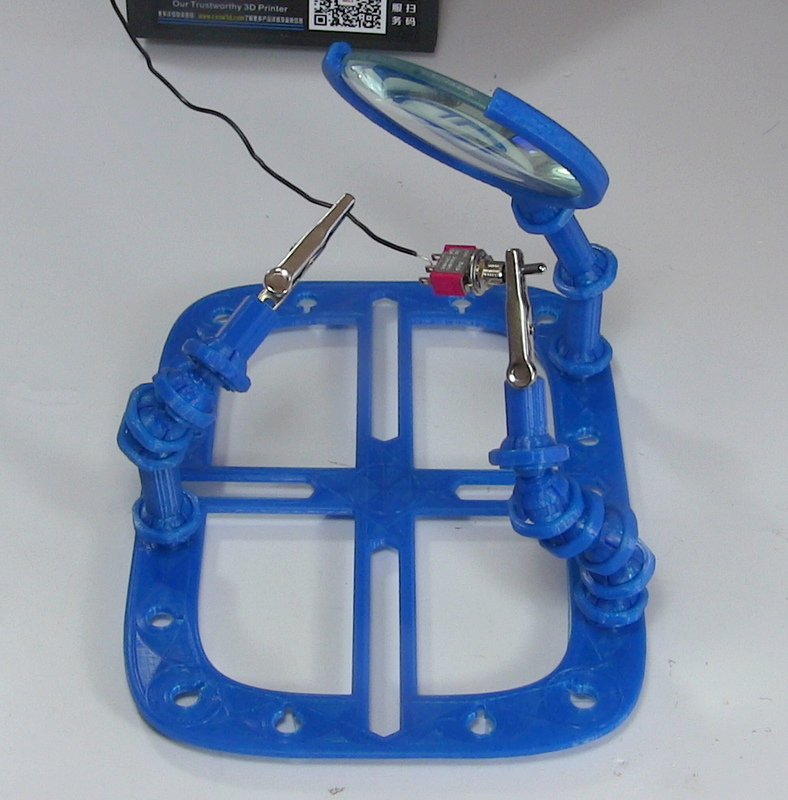 The resulting magnifier looks to be a useful addition to his bench, he’s made the STL files available towards the bottom of his post so you can have a go at making one for yourself. This is the kind of simple hack that can make life so much easier for the SMD constructor. We’ve had another set of augmented helping hands featured here in the past, and of course there’s the ultimate portable SMT station. If SMD soldering is new to you, please also read our SMD guide for the nervous.